Pure Digital has hit back at technical and audiophile critiques of DAB this week, while explaining why it has opted to develop its own proprietary online music portal, in the shape of the Pure Lounge. So, why did the company make the decision to develop its own online portal, instead of using standard portals from the likes of Receiva and Frontier Silicon? 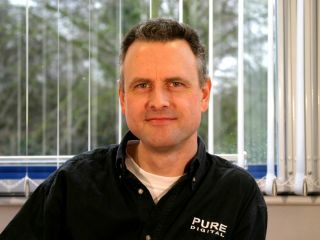 "We looked at all those possibilities when we first started thinking about developing an internet radio device," Pure's marketing director, Colin Crawford (pictured, right) told TechRadar this week. "It became clear to us that it wasn't acceptable for the portal to be owned by anybody other than us. Effectively the portal, well, it is what it says – it is the portal for all your customers. Basically, Pure didn't really like the idea that "hundreds of thousands (and soon to be millions) of customers" might potentially be "held to ransom by your portal provider." As Crawford puts it: "What happens if the portal provider goes bust? What happens if the portal provider gets bought by a competitor? It's just too risky." Is the UK ploughing a lonely DAB furrow? What does Pure think of those DAB critics that claim the government's Digital Radio Working Group (DRWG) is 'ploughing a lonely furrow' in pushing DAB in the UK? "The UK is by far the biggest digital radio market in the world," says Crawford, adding that the market in the US "is entirely funded by venture capitalists – so you currently have billions of dollars being invested in satellite radio over there. "Is it a viable business model? No-one absolutely knows, because they haven't made a single penny from digital radio in the US yet. The other standard in the US, HD Radio, has sold less than a million units to a nation of over two hundred and fifty million people. It's laughable. It is not even remotely a market." "The only standard where you might argue that the UK has fallen behind is with DAB+," says Crawford. "The UK is perfectly positioned to take advantage of DAB+ when it makes sense for the UK market. But it absolutely doesn't make sense now and the broadcasters and everybody else have agreed that." Finally, in terms of criticisms of the quality of DAB audio, Crawford notes that: "A lot of the bad feeling about DAB is around the bit-rate issue. It certainly started there, at least. "And this is fair enough, because in the very early days when the BBC started talking about and promoting DAB, they talked about it as a replacement with the main benefit of improving the audio quality of radio listening. And that held for a while and then they realised that that was wrong…that was actually seen to be the least important benefit, from the consumer perspective. "For consumers, more content is easily the number one benefit of DAB. Ease of use, boring though that may be, is number two. Extra functionality... is number three. And number four is sound quality." Check out the full Pure Digital interview for more. It reveals, among other things, why the company doesn't believe there is a 'transition' occuring from DAB to internet radio.